After a good breakfast we left our good hotel of "Hotel tinto Botique", and walked along the interesting street of Pio Nono. This area had been busy with diners when we arrived late the night before. After working out the ATM to get some local money, we purchased a Hop-On-Off bus, as we had limited time and it seemed to go to the major sights. The bus tour took us past the funicular which runs up the hill to Cerro San Cristóbal. We planned to do this climb at the end of the day. We spent some time at Plaza de Armas (main square), looking at some national monuments such as the Cathedral, the Central Post Office and the City Hall of Santiago. A brass band was planning Creedence Clearwater Revival tunes very well. Next stop was the Government Palace "La Moneda", on Plaza de la Constitution. This is where the USA backed military coup of General Augusto Pinochet occurred on 1973-09-11 and the socialist president Salvador Allende, who subsequently committed suicide. Being in high school, this left an impression on me, but didn't understand why. We passed the Santa Lucia Hill, where the city was founded in 1541, by a spaniard Pedro de Valdivia. The tour continued past the San Francisco Church built in the 1622 and one of the oldest Spanish Colonial building. It was damaged by earthquakes in 1647, 1730 and 1751. We continued on the bus passed the Las Condes residential area and large Parque Arauco shopping Centre. At the end of the bus tour, we took the funicular up the 250m ascent to see the Virgin Mary statue on top of San Cristóbal hill. It gave a great view as we enjoyed an ice cream. After a good dinner in a bellavista restaurants ,we took a walk along the river and park. Then we caught a hire car to the airport from the hotel. Our trip home had started. We enjoyed the relaxed start and late hotel breakfast. As we walked out the hotel front, we were immediately hit by the noises and smell of a busy city and the steepness of the streets. La Paz is surrounded by mountains and from everywhere the residences clinging to the side of the hills are visible. In a reverse of most cities, the rich live down the bottom at 3600m and the less well off live up the hills at 500m higher and spectacular views. Our hotel was between the main square (Plazo Murillo) and the main church (San Francisco) where we first walked. We then climbed the narrow, steep streets to explore the Witches Markets, which comprised of all sorts of stalls selling both locals needs and tourists clothing and sovereigns. Crossing the streets is a challenge as cars, and both regulated and unregulated buses go everywhere. Minibuses pull up at their wim to pickup or drop off passengers and pedestrians navigate between the moving mass. After the stalls and markets we sat in Plaza Sucre to give my back a rest. It has been playing up a bit and the steep walking didn't help. We saw a large park on the map and walked over to have a look. It's a massive park and we just had a glimpse from one entrance. Needing fuel and rest, we found a very trendy coffee shop, called "The Writers Coffee" which was inside a book store. We enjoyed the hot drinks, slice, music and decor full of books, old typewriters and clocks. At Plaza Murillo we saw a lot of security and also the changing of guards. On one side is the Legislative Palace, commissioned around 1900. Also situated on one side is the principal church of Calibro. In 1962, the "zero-mile" mark from where distances are measured was established at this square. We then looked closer to our hotel for lunch and decided to have an afternoon rest after lunching in the hotel. The hotel food was good as was the afternoon kip. The hotel looks and feels like Don Quixote could have stayed here- it was another of Karen's excellent selection of boutique hotels. We walked to the new cable car and paid 3B (70c) to ride to the top of one of the residential areas at 4117m, a climb of almost 500m. The cable car network is expanding and this one was just over 1 yr old in April, 2014. It's a great idea to move residents as the 1hr bus trip down the steep, windy road was cut to 10 mins, and as part of the work they renovated the old train station to be a bus terminal. At the top, we wandered through the local markets which are on Thursday and Friday night. The range of products was intriguing, including car carburetors, movie DVDs, floor covering and kitchen wares. There was no 100% alpaca scarfs for tourist to purchase, something we have seen everywhere. On the way down, it was getting to last light and the rain started. We passed by the Cemetery stop, which is massive in acreage and looks like rows of tiny apartments. Being the heaviest rain we had seen in 3 weeks and fortunately this time we had carried our goretex coats which did their job. We started to look for a dinner spot and found a restaurant area near Plaza Geson Velasco. We settled on "The English Pub" and had a healthy serving of mash with chicken, whilst we watch the first round of the Sth American pool elimination for selection to play in 2016 World Cup in Russia. Bolivia beat Venezuela 4-2 in La Paz, so there was a lot of radios playing from 16:00 and excited locals. We think they were expected to win. After dinner we slowly walked back to the hotel. We did the travel chores of washing some cloths, updating this blog, planning our money so we exhaust our last Bolivia Bobs, and checking flight times and booking a taxi for tomorrow's flight to Santiago on the start of our journey home. In the background was CNN's analysis of Donald Trump's presidential policy to send back million of immigrants without proper residency. Hotel Piedra - a great location and feel. The renovate railway station is now the bus terminal. Near the Witches Markets. I wondered if La Pz's electricity distribution originated from this one pole. An early breakfast and on the road by 7:30. It was a clear, cool morning and it seemed to be a contest among the drivers of each 4WD to find the fastest track as there must have been at least ten ways to go. After about 30 mins driving we visited the railway town of Julaca (3625m). It looked like a ghost town, but people seemed to appear occasionally. It had a dirt soccer pitch that appeared to be used. The next stop was the tidy town of St Augustin (3836m), which was on a small stream and surrounded by agricultural. We climbed the hill over a suspension bridge to a lookout which gave a good view of town and valley. To our amazement further over the hill was a full size soccer pitch, surfaced with AstroTurf. It looked so out of place in an isolated agricultural community, but does show the priority of soccer in Bolivia. The twisty, narrow dirt road continued south up through a high mountain pass at 4210m. 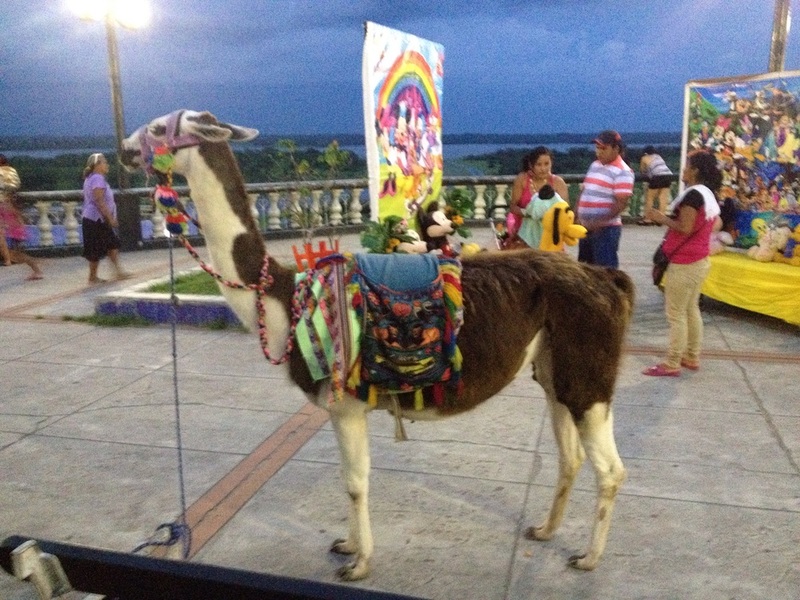 There were lots of lamas and river crossings. Eventually we arrived at a canyon lookout at 4144m. This was a very narrow dirt road hanging on the edge with a long drop to the bottom. Crossing oncoming vehicles required the downhill one to stop and pull over as far as possible, whilst the uphill one carefully crawled past. At the bottom of the canyon (3882m) we watch a heard of lamas and sheep. There was a baby lama that thought it was a sheep. At midday we turned into the "main" dirt road (3825m) and headed west for another 20km before turning off south onto a narrowing dirt road. We had lunch at a scenic spot above the Black Lake (4273m), named for it colour. We climbed down a steep, shale embankment to watch the ducks. This lake is very shallow and the birds eat the micro-organisms. As we headed south towards the Chilean border and between a number of snow capped volcanos, the track became very rutted and rough. Eventually we arrived at the Borax Lake (4454m) which was also smelly and had a strong smell. There were a few flamingos in the distance, and the last 20km (over pass at 4726m) took us to a lake surrounded by stunning volcanos and the lake (4508m) was full of bright pink flamingos. It was a photographer paradise and the remaining MBs on the camera was chewed up was the motor-drive. It was bitterly cold and windy and felt as isolated as the middle of the salt flats, and was about 20km from the Chilean border. 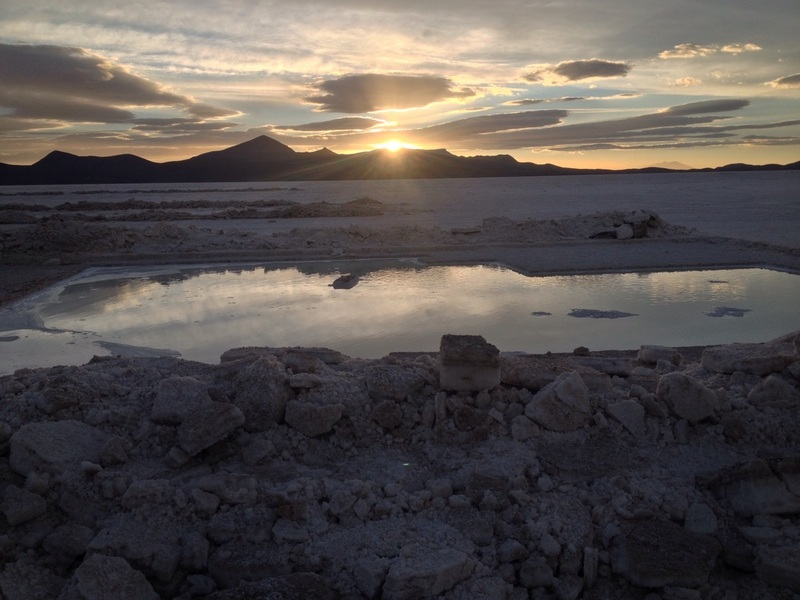 It was 185km back to Uyuni for our 2 day tour whilst the 3 day tour continued on to a national park and hot springs. Once back on the main road to Uyuni, the 4WD sat on 100km/hr, so it was only a few hours trip back. About 100km from Uyuni we stopped at the interesting silver mining town of San Christobal (3758m). The whole town had been moved from the hills for the open cut mine to operate. It is the second largest silver mine in Bolivia. There is also tin, borax and lithium mined in the area. The government has taken ownership of the gas wells and most of the mines pay a high royalty to improve roads, electricity and education. In the past there have been many Bolivian citizen protest against big mining companies taking all the profits, thus the government introduction of a mining tax to benefit the communities. Upon arrival in Uyuni, we bid farewell to the Red Planet team, had an walk around the town and then took a taxi to the airport (about 10 mins). We had plenty of time and use the cell phone to chat with Pat and compare notes of his trip in Jan2015. 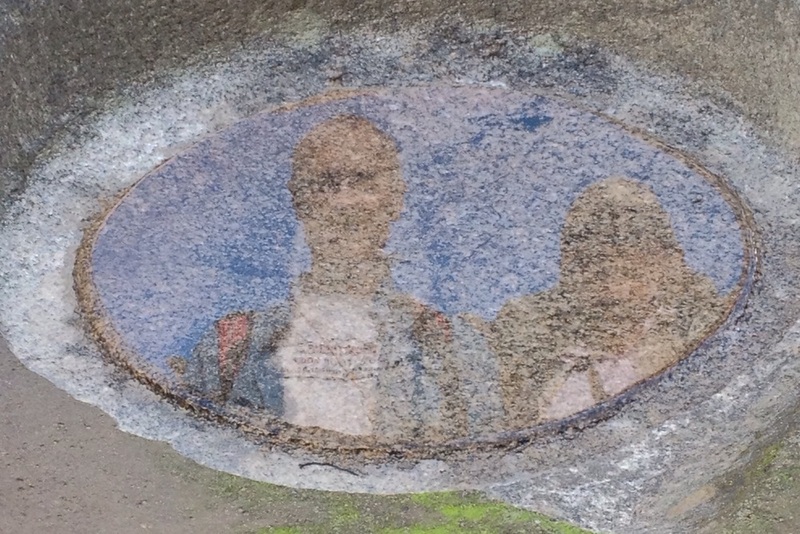 He had water on the flats to make it look like a mirror, and as a result got covered in salt. Our trip was dry and we didn't need to worry about removing salt. 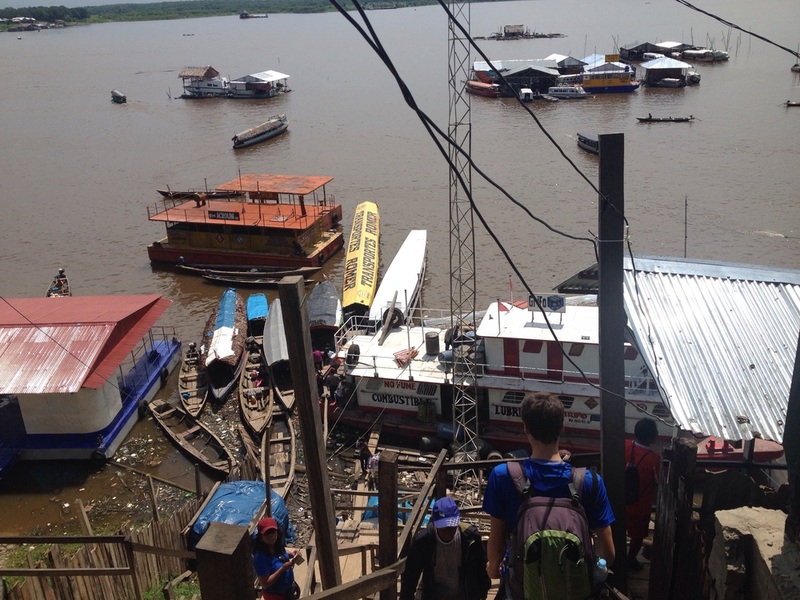 The Amazonia flight to La Paz was about 45mins, compared to 16 hrs on the bus that most people we had met had done. We were into our hotel in La Paz by 22:00, with the heavier traffic a reminders this was a city of almost 1million people in the inner city. We shared a taxi with a young American couple who had been to La Paz on way to Uyuni and then were going to Machu Picchu. The good road back to Uyuni. San Christobel Church was moved from the hill. We started early to withdrawal US$ at the ATM and paid the Red Planet Salt Flat Tour at 7:30am when the office opened. Our tour started at 11:00. Having arrived late the previous night, we had a quick walk around the small town centre, before breakfast at our hotel. Karen noted the picture of the hotel entrance on the Internet was very different to the actual. The original hotel built a long time ago is joined by a long courtyard to the more modern one with the rooms. On our morning walk we noticed a lot of dogs roaming the streets and also a lot of Toyota Land Cruiser. Later we learnt that 80% of the work in this town is tourism related. Not sure how this relates to the number of high number of roaming dogs. Around the town we saw evidence of the 2015 Dakar Rally, when the motorcycles only passed through in January for 2 days. This was just after Pat was here. In 2016 there is a week of activity, as all classes of trucks, cars, buggies and motorcycle will include the salt flats. We loaded into V8 Land Cruiser with Beema (driver and cook) and Carlos (the local English speaking guide) and headed off on our personal tour. There were two others tours, being 3 days from Red Planet that we crossed paths and spent the night at same hotel outside Atulcha, and also met at most viewing sites. There was a mixture of French, Americans, Australians, Germans and Dutch. On the outskirts of Uyuni, we visited the train graveyard, full of old steam locomotives from the mining boom days, and watched as the tourists streamed in to get photos on, under, beside and inside the rusting wrecks. Apparently in summer, there can be up to 70 Toyota Land Cruiser parked here. The salt flats were amazing in both size, and isolation. We had a huge lunch at the town of Colchani, where we had lunch and saw how the salt and iodine are mixed and packaged for sale as a local business to provide income from sales and tourism. Next we headed west to a now unused salt block hotel where there was a large Dakar Rally salt statue built for 2014 race. The salt flats are a visually important section of the race as it looks great in the helicopter shots. In Jan there is usually water covering some of the flats, and the vehicles race thru it. From there we headed over the salt for another 50km (at 100km/hr) into a location to get to a spot where the sky and salt horizon blended together. It was here that the crazy photos from star jumps to tricking the perspective with a small dinosaur in the foreground and human 30 meters back to look the same size. Carlos the guide showed us many ways to trick the camera and took many photos for us. Next stop was the cactus island (Isle Inchausi) which we climbed with a lot of puffing as it was a 90m climb to 3743m altitude. It was interesting to see 1000yr old cactus and were given an explanation of the religious and festive events held on the island in August to make two Lama offerings to Mother Earth (Pachumama). Although Bolivia is 80% Catholic (thanks to 300yrs of Spanish colonialism), they still combine their local beliefs, customs and rituals. Next stop was to observe how the salt blocks were cut for use in building construction. We also watch a good sunset. The road at the edge of the salt flats was very rutted and the driver showed his skill to get us to the Hostel Kachi Huasi at Atulcha which was made of salt blocks and thatched roof and was our shelter for the night. Once you got over everything was made of salt blocks, we settled in for a good dinner and shared travel stories with some of the 3 day tour people. We slept well and recharged our phones with the new power, which is an initiative by the current president to put electricity and schooling into local communities. The temp outside was towards zero and thanks to the block insulation we didn't feel the cold. The train graveyard on the edge of Uyuni is a look back in history. The Cactus Island rises 90m above the salt - it was a volcanic once. After a large hotel breakfast we caught an 8:00 taxi for the 20 min drive through peak hour traffic to the airport. The whistle blowing traffic police were out in force and keep the traffic flowing. Our flight was scheduled for 10:40 so we had plenty of time. The security took my pocket knife, Karen's mandarin, sun cream and both full and empty water bottles. The airport was opened in 1967 and hasn't changed much since. As the departure time passed we eventually got information that the airport was closed so our plane was yet to arrive. Eventually we were allowed back to the coffee shop with the phantom wifi. We had hoped to check the weather and flight tracker. After a delay of 6 hrs we left Cusco for La Paz. We had be told we were moved to 19:00 flight La Paz to Utuni and wondered if we would make it. With no time to spare in La Paz and the fastest immigration into Bolivia on record, we just made the half empty jet to Uyuni. The two flight sectors were about 600km each and each took 45 mins. The snow capped Andres Mountain near La Paz looks spectacular as we landed. At Uyuni we were met by a taxi (organised by Salt flat tour) and shared the taxi with a friendly couple from France. After ckecking into the hotel, and eating a hamburger for dinner we retired after a longer then expected day. First impression of Uyuni is that it's a Wild West town. This was in first sleep-in for a while. We watch the final MotoGP of the season from Valencia, Spain which was the showdown between Jorge Lorenzo and Valentino Rossi for the world title. Rossi started from back of the grid to finish 4th due to a prior race penalty. Rossi's 6 point lead was not enough with Lorenzo winning, the title deservedly went to the Spaniard. My Lorenzo signed Phillip Island 2011 track map becomes even more valuable as he now has 3 titles. We were some of the last for breakfast then had a lazy day wandering around Cusco, looking at the markets, alpaca clothing shops and people watching. The Chocolate Museum is a must. It has samples, description of how our chocolate is manufactured, a good coffee shop and very fast internet. We made some purchases as the variety of chocolate available is extensive. We sat for a while in Plaza Kusipata, as its a lot quieter then Plaza de Armas. The guide had told us to take a walk in the day time to the area west of San Francisco church. We ended up along Neuva Alta street and it was very small houses and local shops and interesting to explore. We went back to BCP Bank on main square and found we could withdraw a max of US$200 ea. We need US$ for Salt Flat tour, so that solved that problem. Still feeling exhausted from Machu Picchu climb, and being back at altitude (approx 3300m), we decided to have an a much needed afternoon rest. We organise a taxi pickup for 8:00 tomorrow to take us to the airport to fly to La Paz then Uyuni. We found some good restaurant set meals for dinner, and although they advertised Visa/MasterCard signs we found that this was not the case. We needed to pay on card as we were exhausting our last Peruvian Sole. Eventually we found a nice restaurant for dinner (Pach Apapa) and although a bit more expensive then normal it still only cost AU$77 and it took a card. Being our last night in Cusco and Peru it was a good way to celebrate including a Pisco Sour. Peru had been a great holiday. We have packed a lot into two weeks in Peru and Cusco reminds us of those Italian towns you can just keep wandering around. It's easy and enjoyable to stop for a meal/coffee and continue and every narrow street is interesting and each hilly area has a different view. Tomorrow with fly to Bolivia. Plaza de Armas is full of tourists, hawkers and police. The 4:00am alarm went of in competition to the 24x7 rooster next door. Karen met the guide and took the first bus at 5:35. Bus cost is 80 sol (us$24) return up a very steep series of switchbacks. Guided by my super head torch, I set out walking from the hotel in Aguas Calientes at 4:25, to wait for the entrance at the bridge to open to start the climb to the site gates. It's a steep climb and took about 1.5 hours and I arrived not long after Karen at 6:00. It was a misty, humid morning, with stars visible and there was a steady stream of fit, young and not so young making the accent. The entry gate to the Machu Picchu site is a hive of activity with big tour groups, hikers who have done the 4 day Inca trail to get here, and rich tourists who stay in the Sanctuary Lodge (located at site entrance). We had an English speaking guide for 2 hours, and he knew the best directions to head to avoid the crowd. Machu Picchu is so much larger in area the I expected, probably because all photos are taken from mountain top. The architecture, engineering and work quality are impressive. It is a series of temples, houses, farming terraces and specialist building like astrometry. The clouds, sunlight and surrounding mountains make it a photographer paradise. After the guide left, we had some expensive coffee (much better then Aguas Calientes) and rested in preparation to climb Montana Machu Picchu mountain. It is about a 600m climb from the entrance gates and is 3025m at the top. It took us about 2:45 up and about 1:45 down from the mountain entry gate. Our start time was 9:00-10:00 and the site official at the top starts blowing his whistle to start descending at about 12:30. It was a tough climb and is mostly high steps to achieve the elevation so quickly. The view was greatcand other climbers were encouraging as we met a number coming down as we still ascended. I came around a corner to hear the sound of a popping cork and clapping as an Irish couple get engaged- they seemed to make it down even after the champagne! We were careful coming down. Our guide told us a women slipped and broke her leg the day before. Karen's phone app counted about 12,000 steps walking around the site and climbing the mountain, and our legs told us so. As we arrived back to the main site, it was very crowded with big tour groups. We then joined the bus queue (US$12 one way for me) and descended the steep dirt road. Some walk down as well, but not for me. We found a cafe near the railway/bus stop and ordered our first meal for the day. The Coke Cola tasted great. This restuarent was also expensive and added a 11 sole "tax" - that was a new one. 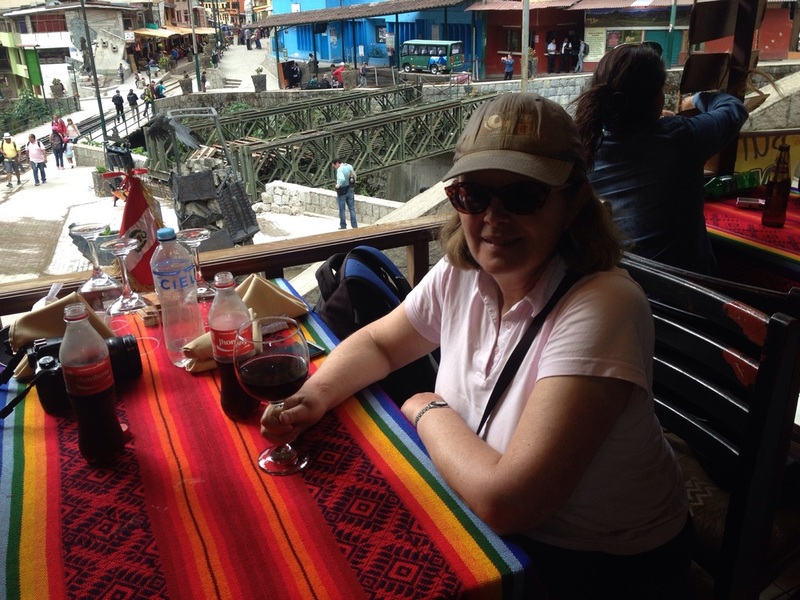 In summary, spend as little time and money in Aguas Calientes. None of the free Wi-fi worked after paying for expensive drinks. So we went back to the hotel and waited in the lobby for the 17:00 train departure time. This train was a bit more luxurious, and the complementary drink included peanuts. We enjoyed the rest on the 1.5 hr train trip to Ollantaytambo and were met by and agent and put on a small bus for the windy 2hr trip back to Cusco. The driver dropped us a few blocks away and were into bed by midnight after a long day. The walking bridge opened at 5:00 after 30 mins walk in the dark. Just one more photo before we left. Another 5:30 pickup for transportation to the train to Machu Picchu. The trip is about 60km to Ollantaytambo train station and a very windy road in places, especially descending into the valley. The driver was pretty crazy, especially on some of the overtaking moves. We arrived at the station at the scheduled 7:20 departure time and fortunately the ticket collector managed to get us on before it departed late. Patrick had missed his morning train by minutes with the same company (Tierrasvivas.com) in Jan 2015, so it seems it's common practice. Other then that their tours are good. The train trip is about 1.5hrs and follows the river. It's scenic as the train hugs the cliffs above the river going further into the valley. Upon arrival, we were met and taken to our hotel, before getting an English speaking guide and heading off on a walk to the waterfall. The flowers, tropical plants and butterflies were in abundance and we took about 1:45 to walk the 7.4 km. The walk back was a bit slower as our legs tired. There were all varieties of trekkers from serious 4 day Inca Trail walkers to those in thongs. After a late lunch, we researched the climbing at an overpriced coffee shop and then rested and prepared for tomorrow. Dinner (also included in package) was in the same restaurant. 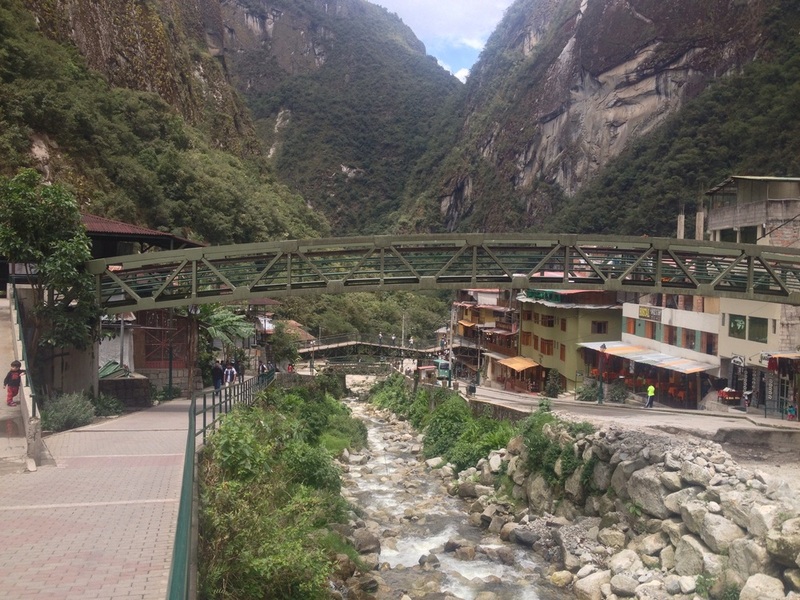 This town ( Aguas Calientes) is acknowledged in most reviews as overpriced and not a place to spend time and I agree. Tomorrow we climb Machu Picchu. The scenery from the train when heading toward Machu Picchu. We arrived at our hotel (Rumi Punku) and waited in the lounge for a couple of hours until the room was available. In this spare time Karen updated her Facebook and I caught up on this blog. After a much appreciated shower (after the overnight bus ) we walked up some the narrow and steep streets near our hotel. We had a tasty french toast for breakfast, then went to the main square (Plaza de Armas)and started wandering the radiating streets. We noticed lots of camping and hiking gear shops and there was a lot more street sprukers then we had come across. The weather was getting warm, and threatening showers did not come. We did a great 2 hour walking tour (Marco's Walking Tours) which leave at 12:30. He gave a good mix of history and current information on Cusco. We finished up with a Pisco Sour drink and left him a deserved tip. The square has two churches which seems excessive, then another within two blocks. They were all built on existing Inca building by the invading Spanish. After an afternoon sleep, we met the trek agent, paid the remaining balance and viewed the square at night. After more Italian for dinner (it agrees more with our stomach) we sorted our bags ready for a 5:30 pickup. Lots of old Kombis in Cusco - a reminder of my youth. Up early for a 5:45 Peru Hop pickup with guide (Alexandra) we had a 3/4 full bus that had come from Hauchachina and dropped off the overnight passenger at their hostel. Peru Hop runs like a parcel consignment service with people booking ahead to take a sector (hop). So far it has worked really well. The bus followed the same very twisty climbing road as the previous day and then veered west towards Juliana, where those of us going to Puno took a smaller bus. The other bus continued to Cusco to be there at 17:30. We pick up one from Bolivia at 22:00 to get us to Cusco at 5:30am. The land around here looks a lot more fertile with lots of cattle, and mandatory alpacas. It must be cold in winter as the lake is 3810m elevation. We arrived at Puno at about midday with weather still fine even though the rainy season is approaching. Temp is 17c in middle of the day and belong zero at night. We walked around Puno and saw a parade and a lot of traditional dress. Turns out it's 347th anniversary of Puno. Lunch (with wifi) was used to kill the remaining time until our boat tour. The Korean lady joined us and had bad altitude sickness and tried coca tee, followed by a remedy of hotel staff of rubbing medical alcohol on hands then rubbing face and breathing some in, and also self administered acupuncture. I tried the pure alcohol and it worked a treat. The guides had recommended a magic alexa in a small bottle named "Agua De Florida", which we bought out of interest for 3s. I think it is pure alcohol with herbs to give it a smell. Will try it at Cusco. The tour of the floating village was interesting, if a bit touristy (expected). There are 2000 inhabitants in groups of approx 7 families on their own island. We got a tour of a house, dress up in traditional dress and we bought a embroidered runner for 70s (about AU$30). The reed boat ride was another 10s and the girls singing asked for loose change. Tip for Peru is to have lots of small notes and 1s coins. After the boat ride we elected to walk back to the main square via the railway station, which still runs passengers to Cusco. Before bitumen the trip from Bolivia was boat across Lake Titicaca, then train from Puno to Arequipa. We found a bar and ate listening to Guns and Roses and Peruvian rock as we killed time awaiting our 22:00 departure overnight to Cusco. The bus arrived Cusco at 5:00am and we waited in the hotel lounge until the city work up. 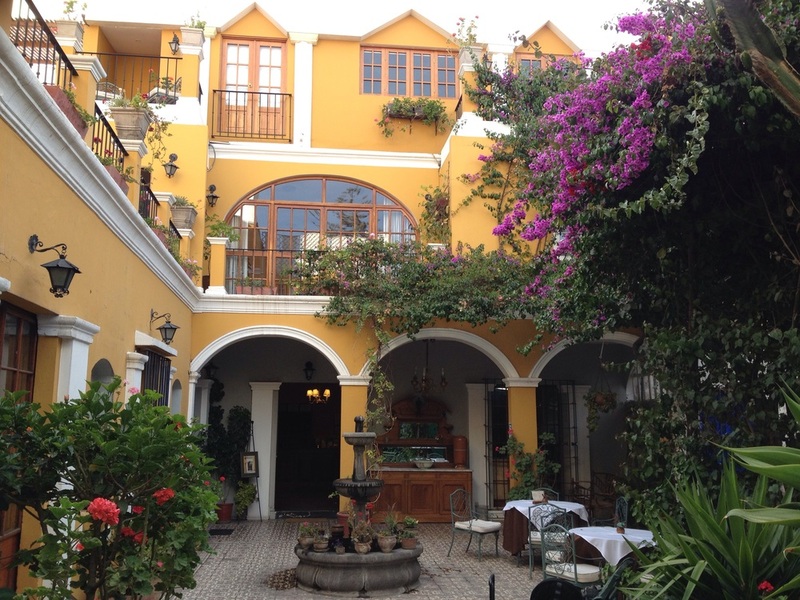 Arequipa - La Hosteria - very nice hotel to stay. Day 11 - Chivoy to Araquipa. Day 11 - Chivoy (Colca Canyon area) to Araquipa. We were picked up at 6:20 for the trip out a long, rough dirt road to Condor lookout. Most had some symptom of altitude sickness as sleeping for the first time at 3600m (12,000ft) takes some time to adjust. A short distance away at a small village of Yanque, in the town square we saw some traditional dancing by the locals. This was done early before everyone went to work and school. For a photo it's practice to tip 1s, which is fare. I also got my photo with an eagle on my arm. At the Cruz del Condor lookout, we saw 14 condors in flight, with some very close to the cliffs. They are very lazy, as soon as one finds a thermal they all follow. So one minute they can be nearby, the next kilometers away. We then walked along the river cliff path. It gives a fantastic view of the Colca Canyon, which is 5000m deep in places. The valley has been a food producing area forever, and it rains everyday in February. We went to an old church that had been destroyed in earthquake of 1958 and restored with grants from Spain. Colonialism by Spain (1532 - 1821) and independence to current times. There have been a few invasion by Chile, and a lot of the grand squares date from colonial or mid 19th century. Even the smallest town has a church on a square. We then travelled the 3 hours back to Araquipa, and it faster being downhill. After checking into our grand hotel, where there was a film crew at work in the garden, we crossed the street and fitted in a tour of the monastery. (Siena Santa Catalina Monastery). It was opened to public in 1970 after 391yrs. The life of a nun was entirely within the wall of this architectural interesting building, with only the view being the snow covered volcano. Becoming a novice at 10yrs old, then having to pay a dowry to stay was certainly devotion to catholic faith. There was a lot of security in the main square, lots of people out and later fireworks we could view from our hotel. There was a world congress of heritage listed city, and it seemed some of the delegates were staying at our hotel. Our hotel (Hotel Hostelia) was like a scene from a movie, with beautiful gardens and furniture and decor to match the style. We walked through the crowded square, then back to hotel to prepare for another 5:30am pickup to Puno. We leave Arequipa enjoying our brief stay and wishing it was longer. Church destroyed in 1958 earthquake and rebuilt. Snow covered volcano viewed from inside the Monastery. 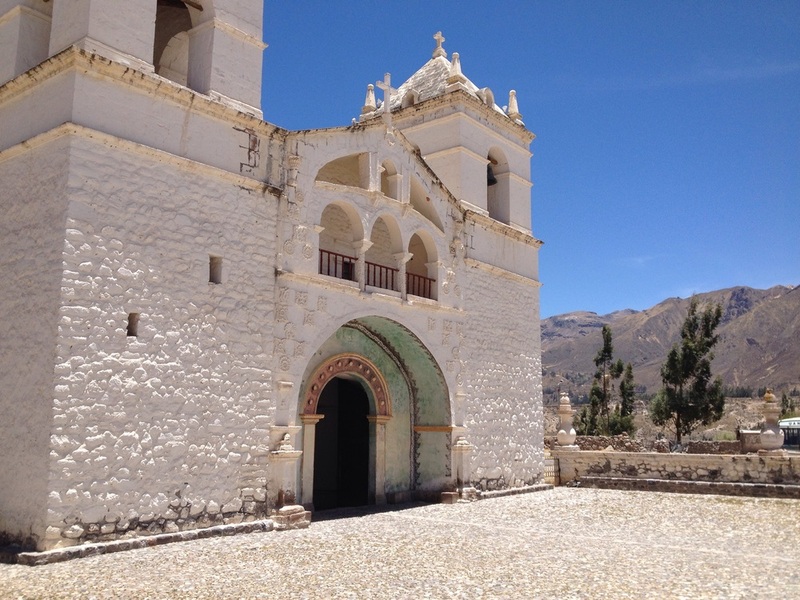 We were picked up at 8:00am for the trip to the Colca Canyon, which is about 5000m deep. We had a number of stops to acclimatize to the altitude, the first being at 4018m to see the house shaped rocks and try the traditional coca leaf tea. The later is supposed to help with altitude sickness. We also tried the more traditional drink of Coca Cola, which also has good remedial powers. The highest road pass was 4910m where we saw a snow covered smoking volcano. On different sides the water flows to the Pacific Ocean (25%) or down the Amazon to the Atlantic. In Chivay we had lunch, then a look around the markets including the non refrigerated lama carcasses being cut up. We also learnt they grow 52 types of corn in the valley, and 2000 species of potatoes in Peru. After a good 1 hr walk to a high point we had a spa at hot springs. Dinner was pizza with other in the group then sleep for a 5:30 start. The hotel is pretty basic, but compared to the town its "luxury". After eggs for breakfasts, we dropped our backpacks with the Tour Guide to be put on the bus leaving after lunch. 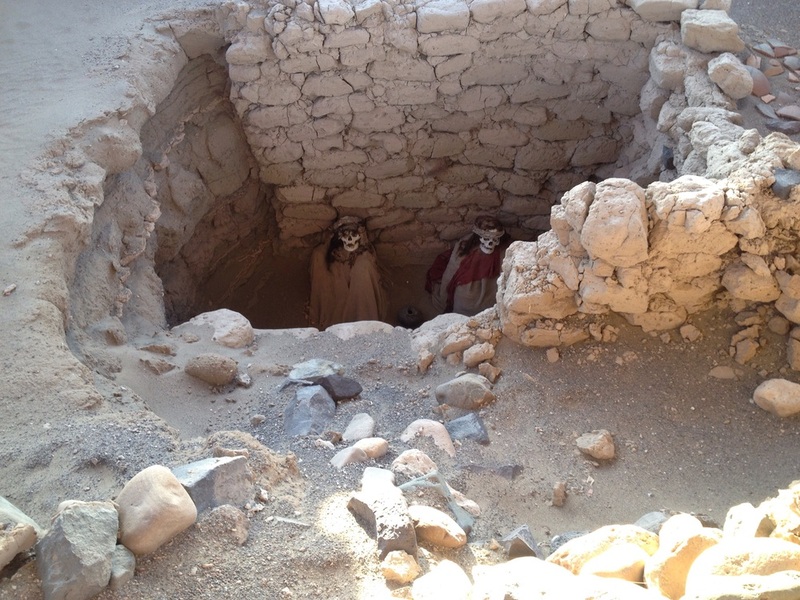 We would meet them in Nazca. Along with 5 Eustonian, we took a local taxi to Ica (8s total) and then caught a local Soyuz bus (10s ea) the 120km to Nazca. It was very barren landscape with lots of overtaking of semis. Also a number of stops to check our tickets on route. The trip from took 2.5 hrs. We then were transported to the local airport and paid US$74 ea + 25s airport tax. We shared the 8 seater Cessna with a friendly columbian family who were on a one week holiday. 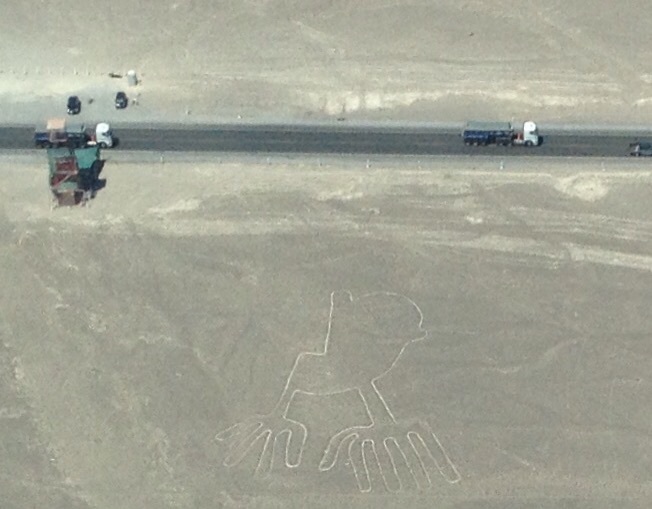 The flight at approx 800ft (city is at 1700ft) and took in about 10 different figures (monkey, dog, man) and some of the hundreds lines built around 200-700AD. There was lots of steep turns so each side could see and it was quite warm. We had a late lunch in Cuzco at an nice upstairs open cafe, and took a tour (along with slow Estonias) to see the 1300 yr old mummies, about 30 km out of town. It was amazing to see such well preserved bodies, probably as it only rains for 8 hrs per year! The tombs were first found and pilfered 80yrs ago after being untouched for so long. Day 8 Lima- Paracas- Islas Balestas - Huacachina. It was a 5am alarm to be picked up to travel the next part of our trip on PeruHop bus to Huacachina. It was about 180km to Paracas, where we took a 40 person high speed boat 8km out to the protected islands reserve of Balestas. It was good to go so close to seals, penguins and a variety of bird. The later contributed to the smell and colour of the island. After lunch we travel through more coastal desert to Huacachina via Ica. We did a dune buggy tour of the dunes and also sand boarding. Now there is sand everywhere. We watched the sunset from the dunes above town. Dinner was quick and cheap food at bar overlooking the lake. Our first sleep in for a week and then we walked down to Huaca Pucllana, which is a clay pyramid and now an archeological site. It was hidden by dirt/clay and only discovered in the 1920s. It dates from 200-700AD and was a ceremonial and admin site and was very impressive in its engineering and layout. Next we headed to the city centre in the afternoon traffic. There are many European style palaces from the Spanish colonial time (15th century to 1821). Lastly, we saw the amazing catacombs at the Franciscan monastery were family paid to have their loved ones buried under the church- it was a good business model for cash flow. The traffic back to the hotel was some of the worst I've seen, mainly due to gridlock on intersections. Dinner was a tasty Peruvian Italian in the interesting area around 'cat' park (Parque Keneddy). Most Restuarants are decorated for Halloween. The alarm is now almost going off before we go to bed. The small boat left at 5:30 with the French Canadians and Karen and I aboard and we headed off to look at the prehistoric lake. The remainder of the full moon was setting and it was a beautiful, clear morning. 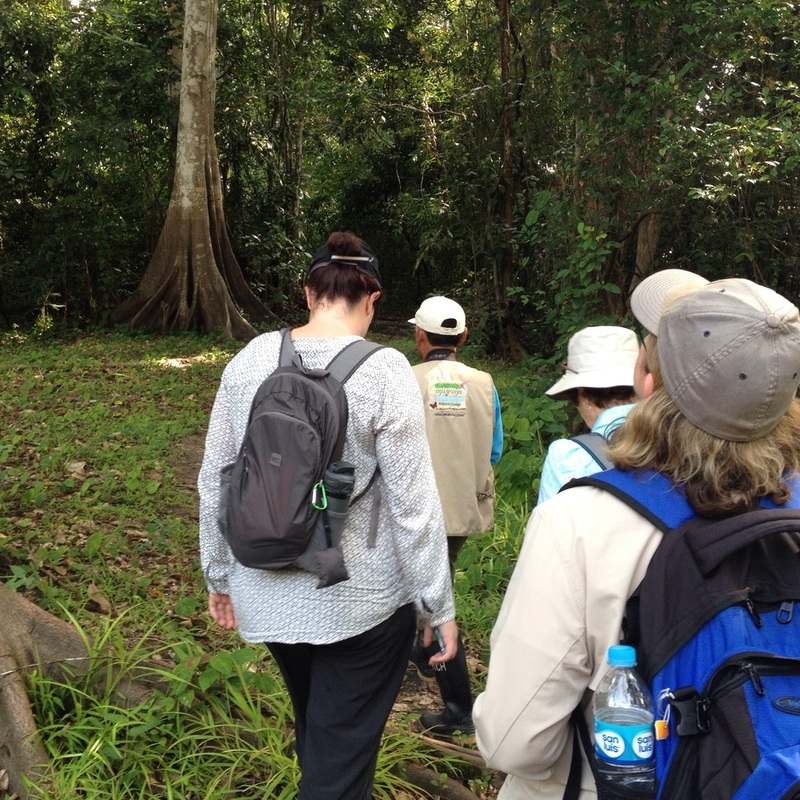 We walked for about 30 mins after the boat trip, through some quite thick jungle. Moises's machete is very sharp and cut through most vegetation with ease. There was plenty of wildlife including a rare red bird (hat zen), some of the nearest spider monkeys we had seen, and noisy swamp birds. We elected to finish with a visit to the local village of San Juan. It was only a couple of kms away and we took the books and coloring pencils for the school. We also bought bracelets and a Cayman tool necklace (5-10 sole each) making sure between all of us we purchased something from each seller (as suggested by our guide). This village was 13 families and 96 residence with a state provided Mayor and infants/primary teacher. 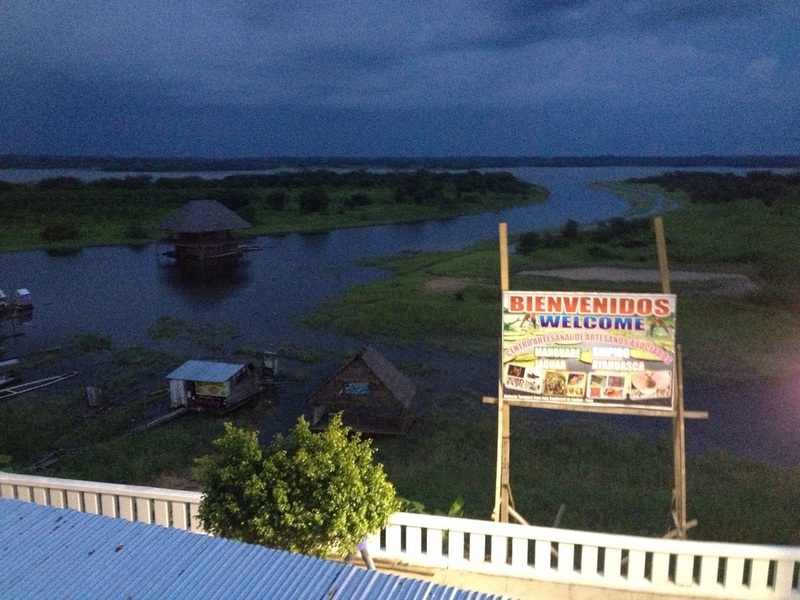 Usually the children and family move to Iquitos for high school. The village also had a sharman, who has the recipes to brew up the medicinal plants. The mayor has a 2*2m jail under his office. A sentence of 24hrs is not uncommon for refusing to work or being drunk. The village has a generator for limited street and house lights. The night before a local mother was bitten by a snake walking the path between houses and the mayor had to radio to get anti venom. She was recovering the morning. After an early lunch the departing guest took two smaller boats as the water had dropped since our arrival. We transferred to the fast boat at the main river and with the tide assistance were back in 3 hrs. After collecting our big packs, we Transferred to the airport and caught up on emails, messaged Simon and Pat and had a long mobile call to Pat. The flight was full and the departure area was busy due to delays in another flight. It's 1000km from Iquitos to Peru over the Andes mountains, which is the main catchment for the Amazon (both snow and rain). On arrival we had a car organized to drive us to The Hotel Antigua in Miraflores. It a few blocks from the one we stayed at 5 nights back, and is grand architecture. Breakfast was at 6:00am, before heading up the river to start our 4 hr trek. Moises, the guide was very skilled at listening for animals and we saw an assorted of spider monkeys, and also the biggest monkey in the forest. There were lots of birds and some large turtles in the lake. There was not a lot of mosquitos, possibly as our cloths feel saturated with deet insect repellent. After lunch we had a much needed sleep before heading down river, then through some narrow channels to other streams. It amazing how they navigate, as there are streams and channels everywhere. By April, at highest river these have all combined. The river rises about 10 meters from it current lowest mark. We found a fishing spot near the river edge and the guide quickly caught a fish, although not a piranha. A couple of small piranha were caught here, then we moved to another channel and eventually we all caught some fish, which was later cooked and brought out for dinner. After dinner we took a canoe trip to listen to the animals and spot sleeping birds and tiny bats. It was very peaceful as the guide did the paddling and had a strong head torch and laser pointer. Tomorrow is our last day, with a 5:30 start. So far no rain, and clear nights, with the full moon just finished. The 5:30am alarm came too fast, and the group was ready to depart on the boat. Being early we saw a number of monkeys and birds, including a Big Tern, Maccau, and King Fisher. Some of the tributaries were weeded over for hundreds of meters, and the outboard properly was always being checked and cleared. Moises the Guide hand speared a number of fish which was impressive. Breakfast was in the boat after we had travelled for 2 hrs. It was warming up , and getting humid by the time we returned for lunch. After lunch and a rest, we headed back down the channel to see pink Dolphins and have a pleasant swim in the Amazon River. There were lots of locals out swimming and washing cloths and body as it was a cooler afternoon. Dinner was again filling, with fish skewers and other local produce. Next was a night walk with head torches to see a Tralanchula Spider, frogs and termites. A very full and amazing day of seeing normally zoo animals in the wild. Day 3 - Iquitos to Myuna Lodge. After our last messages with Pat before going off the grid, we had a good American breakfast and were picked up by the Myuna Amazon tour shuttle bus. We paid the final balance in local currency (Sole), left our two backpacks in their office and were driven a couple of km to another wharf to catch the boat. The water level was lower then normal, and the town wharf was not operational. The tour guide told us it had been a record high and low river this year, and also most of the water come from melting of Andes' snow. The boat had a Canadian French couple and a young spanish couple from Barcelona. It took about 3 hrs to travel the 140km to Myuna Lodge, passing a number of small villages. One even had a cell tower. Following on maps.me we seem to take a few shortcut from the main Amazon River. We took a left turn up a very narrow and shallow stream, where the propeller hit a log. This must be common as the driver had plenty of spares and fixed it in about 20 mins. The lodge was about 10 km up this stream and the river opened up. Upon arrival we met our guide Moises and had lunch, before having an afternoon rest in the hammocks. At 15:00 we put on our gumboots and went for a rainforest walk for a few hours. We saw noisy monkeys, woodpecker bird, pigmy monkey and other birds. It was very tiring in the humidity and nice to get back for a pre dinner rest. After a good dinner, we went about 5km up river looking for wildlife. Moises had a powerful spotlight. They caught a 2 yr old Cayman (Amazon crocodile) which was only 400mm long. We also say the giant rodent. It was almost full moon and a clear night. It was nice to shower and wash off the deet 80% insect repellent. In the morning we start st 6:00. Arriving Myuna Lodge - home for the next 3 nights. 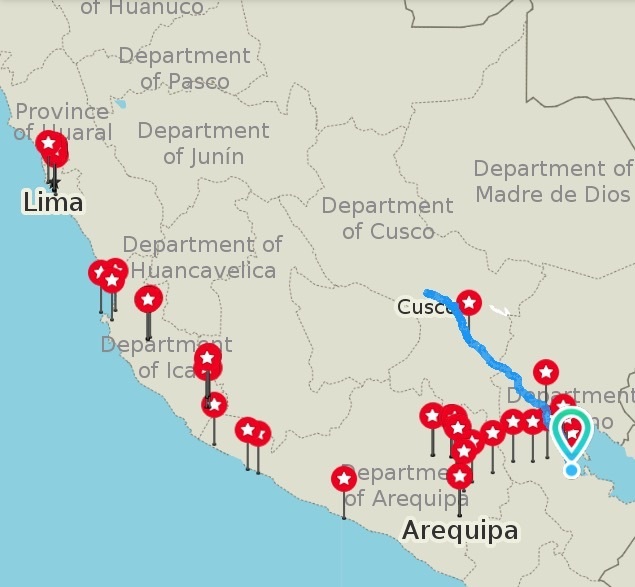 Day 2- Lima to Iquitos. We awoke early and exchanged messages with home, before walking again down to the park above the beach. Being Sunday it was quite on the street with runners out in the humidity and surfers in the ocean. The flight to Iquitos was mainly above clouds and I was amazed there was a city of 1 million people carved out of the Amazon jungle. 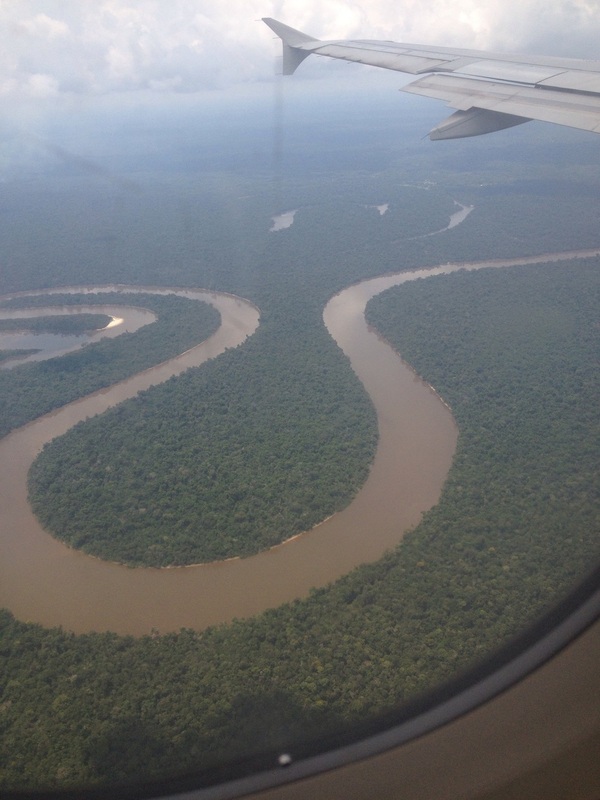 The river showed where it snake thru thick jungle when the clouds open up and we landed after a 1.5 hr flight time from Lima. The passengers included some very loud American looking more urban camper then us. Iquitos has 5,000 Tut-Tuts mainly powered by 125cc Hondas. We took a taxi at double the price to our hotel. With no roads to access, cars are limited and shipped in. Our looked like it arrived when Madonna had here first hit. We checked in, turned the air con up as relief from the heat/humidity and eventually headed out on foot mid-afternoon to site see. Iquitos hit it peak in the early 1900s when Luis Morey, a rubber plantation baron turn it into a thiving port until the rubber boom finished in 1920, due to competition from Asian. Some on the old buildings remain along the river and around the town square of Plaza De Armos. The Casa de Fierro(Spanish for the Iron House) was designed by Gustave Eiffel and faces the square. We are a late lunch in a lovely, Wild West bistro before watching the afternoon storms, along with many other, flashing lightning over the Amazon. Dinner was down town with Karen getting her first Bisco Sour drink, before walking back in the drizzle and packing for our 3 days ahead. Tomorrow take a boat to a lodge 140km up the river to experience the jungle. Eiffel designed, Paris build "Iron House"
I waited in hope of getting the balloon man in the picture frame.